Light and Motion's lights are designed to enhance the ride quality and experience by increasing visibility on the road, and this Commuter Combo is a testament to that. Combining two of their best-selling offerings, this package includes the Urban 1000 front light and the Vis 180 Pro rear light. Up front, the Urban 1000 provides up to 1000 lumens of illumination – now with Light and Motion's SafePulse beam technology. The Urban 1000 and Vis 180 Pro maximize visibility and safety with its innovative amber side lighting, enhancing visibility from the side for a full 360º range of light when used with the Vis 180 rear light. Both lights feature the highest rated CREE LED's, certified to the FL-1 standard. Waterproof and weatherproof for all-weather reliability and submersible up to 1 meter. 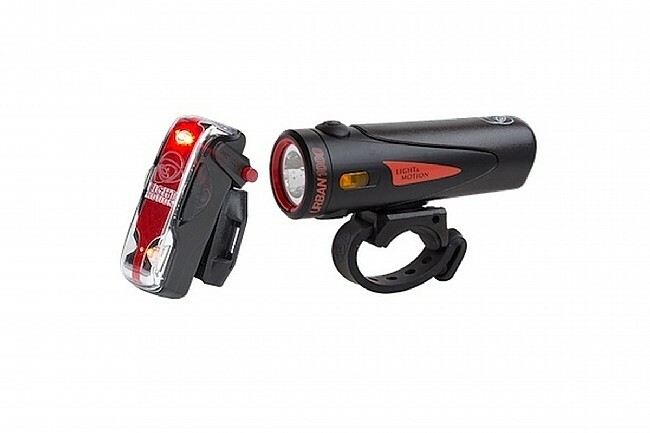 Contains Urban 1000 front light and Vis 180 Pro rear light. Lumen output: 1000 (Urban 1000), 150 (Vis 180 Pro). Output certified to FL-1 standard. SafePulse Beam maximizes visibility by enhancing driver's depth perception. Lights designed to create an effective range of light covering 360º. Includes: Quick release handlebar mount, Seat post mount, Micro-USB charging cable.